Deja vu? Due to a computer glitch (read: operator error), this post was published recently – prematurely. Somehow my finger managed to hit “Publish” instead “Save Draft.” WordPress, maybe you could add an “Are You Sure, Idiot?” message before publishing? I’ve added a few photos since that inadvertent post. These are some of the images that Kel, Ike and I see on our daily walks. 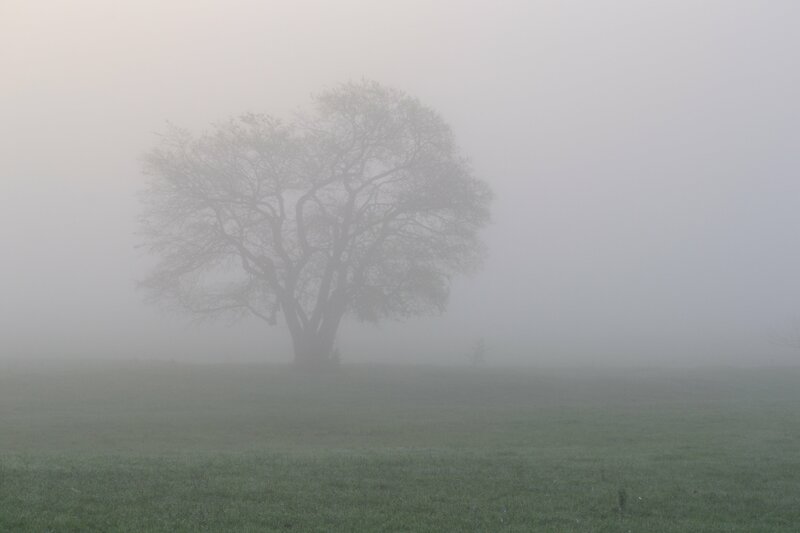 Hackberry Tree in Morning Fog. Box Turtle in Dewy Grass. Tracks Through the Wet Grass. Old Deer Stand in Woods. Weathered Bird House on Windmill; Honeysuckle in Bloom. New Leaves on a Young Oak Tree. Rusty Barbed Wire, Old Wood Post. I wondered what had happened there, I clicked on my email to view your post yesterday and it wasn’t there! Glad to see it’s appeared now though. What a stunning collection of beautiful photos. It’s so nice to see the area round where you live, it’s utterly charming. I especially liked the foggy pictures, I like a nice bit of atmospheric fog. Haha, oh dear…Thanks, Lorna. I like the foggy ones as well – didn’t think they would come out, so it was a nice surprise. Gorgeous photos Ann! Isn’t WordPress funny….I totally agree the “Are you sure, birdbrain (in my case)?” button would be brilliant….done it a few times myself! Happy Monday to you! Love this post today..
Phew – glad I’m not the only one! And thanks! Hope your week is off to a wonderful start! Breathtaking! Where you live seems so peaceful yet complex, must have been a nice walk. These photos are so beautiful and peaceful. How lovely your daily walks must be! The huckleberry tree picture is absolutely gorgeous. Thank you! I’m so glad it came out – you never know when you snap the photo. What a magnificent stretch of land! Looks so peaceful. Keeps us sane…most of the time. Wow, that looks so nice and peaceful! I crave the country since I’m working in NYC all the time! Thank you! I’m just learning the ins and outs of a new camera – fun, but challenging! Beautiful photos!!!! Looks like a gorgeous and peaceful walk! And awww on the turtles, I really really love turtles, you really made my day with posting these pictures!